LEW Techniques will be attending PHOTONICS WEST, from 30 January to 1 February 2018 in San Francisco, to showcase its capabilities in precision submounts and carriers for laser diodes, laser bars, laser stacks and photodiodes. Product types include submounts made from tungsten/copper (WCu) with super-sharp edges (<5µm radius) which allow the laser diode to be positioned right at the edge of the mount. Precision-machined tungsten/copper inserts can also be brazed to solid copper bodies to maximise heat-sinking whilst minimising expansion mismatch between carrier and laser die. Submounts are also available in aluminium nitride (AlN) with photo-patterned metallisation to provide high-precision circuits. Metal structures can be tailored to meet individual requirements for soldering, wire bonding, electrical and thermal performance. Both the WCu and AlN-style mounts can be selectively coated with a thin layer of AuSn solder (typ. 3-5µm), allowing the laser die to be accurately and consistently mounted. Metal coatings and solder alloy consistency are strictly maintained to ensure the best possible reflow results. 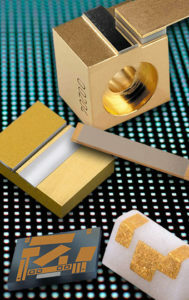 Mounts for photodiodes on ceramics with wrap over conductors are also available. Circuits can be defined on multiple faces allowing greater interconnect flexibility and the ceramic can be precision machined for greatest functionality. LEW Techniques has specialised for 50 years in the manufacture of miniature components for the mounting and interconnect of semiconductor devices. To see examples of our capabilities and to discuss your requirements please join us at the show or contact us to discuss your design details.